Veggies & Virtue specializes in offering age-appropriate infant and kids food ideas, meal time organization tips, expert advice on pediatric feeding topics like picky eating, and effective tricks to help kids to enjoy healthy foods. Receive community-only info and links to Ashley’s latest blog posts once per week. Streamline meals and snacks with these meal planning templates and easy to follow playbook. Find ideas for what to feed your family and bring real food around your real life table. Discover Ashley's favorite feeding products from Amazon and elsewhere. "I love Ashley's approach towards exposure. For meal times, I try to make sure I incorporate some of each category. Before Ashley's approach, it was easy to just give my daughter "love it foods," but I have since seen what Ashley's approach can do. My two year old daughter doesn't have to eat what I offer. She knows that, and it calms the eating experience so much! If she just eats her love it foods, then that's what she does. On her own though, she will put foods in her mouth she wouldn't previously touch. She may spit them out, but it's progress. I never would have realized how important this method is. Ashley's approach has saved me from a lot of heartache and meal time stress. 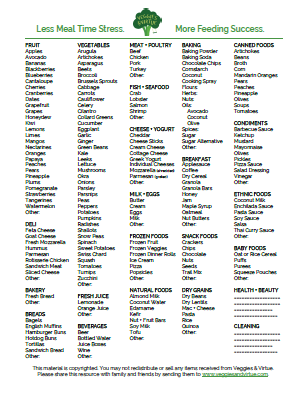 Now, I always have some of each category on hand and understand how to best feed my daughter." HAVE A QUESTION FOR ASHLEY? Use this simple form to send Ashley a message.